Utility companies’ lobbyists and public relations campaigns regarding AMI Smart Meters apparently cite safety statistics and information that say, “cell phones are astronomically bad and Smart Meters are next to nothing,” as found in the PSO of Oklahoma trifold brochure explaining Smart Meters. One determined Owasso, Oklahoma, resident, Mr. Joe Esposito, took it upon himself to perform a test to challenge PSO’s trifold brochure statistics regarding AMI Smart Meter safety, after listening to Dr. Dietrick Klinghardt, MD,  discussing health concerns from Smart Meter EMF-RF exposure. Much to Mr. Esposito’s credit and determination, he spent over $1,000 several years back to purchase a digital microwave radiation measuring device—the HE35C High Frequency Analyzer—that he used to perform seven tests to check the veracity of the statistics PSO published in the “Health and Safety” section of its trifold brochure. Mr. Esposito went about his research using exceptional methodology, plus videography and chart production, for someone who apparently is not a professional scientist. Additionally, Joe published 94 articles about Smart Meters in the Banner Newspaper  in Oklahoma. The PSO took its statistical information for the trifold brochure from the 2011 California Council of Science and Technology document. However, Joe found contradicting research stats published January 31, 2016 by Dr. Daniel Hirsch, which indicate the exact opposite for the safety of “cell phones at ear during use” than what PSO says in its brochure! As a result, Joe wanted to know what the real deal was regarding EMF-RF exposure for all the exposures PSO cited in its brochure, so he made this 43 minute video on February 3, 2016. The first 13 minutes introduce and explain what Joe does. The actual High Frequency Analyzer tests begin at 13:08 on the timeline. Using his HE35C High Frequency Analyzer, Joe documented via video and comparative charts, the real-time EMF exposures from various EMF-emitting devices at various distances, as listed in the PSO trifold brochure. It needs to be noted that every one of the readings that Mr. Esposito’s High Frequency Analyzer came up with proved unequivocally that the information put out in the PSO brochure for consumers’ education, awareness and assurance of safety regarding Smart Meters was apparently erroneous or false, and definitely misleading. The results are shown in the chart below. Source: Joe Esposito Testing Video @ 36:50 mins. For anyone who’s concerned about non-ionizing radiation (EMF/RF) coming from Smart Meters attached to or in your home, the work that Joe Esposito has done certainly proves that all 50 U.S. states’ Public Utility Commissions need to “go back to the drawing board” regarding Smart Meter safety and health issues. 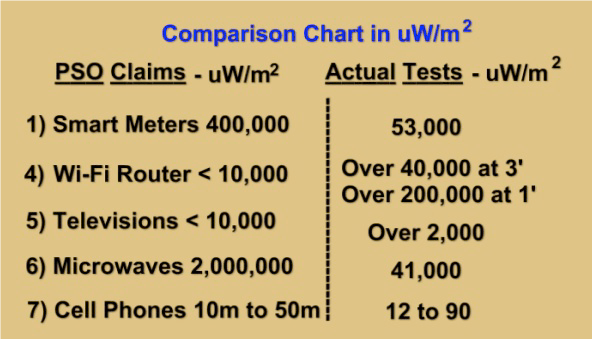 There is too much medical and scientific information, studies and data published that documents what’s called “Non-thermal adverse health events from microwaves” being emitted from cell phones and towers, Wi-Fi, monitoring devices and utility company AMI Smart Meters. Since Smart Meters are an integral part of the “Internet of Things,” perhaps too much successful lobbying was done at various federal agency levels regarding the inaccuracy of EMFs/RFs emissions from Smart Meters, and Congress needs to get involved too, since it has oversight. Why? 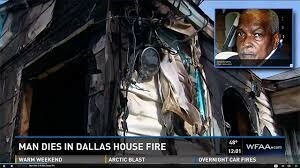 U.S. taxpayers are having their houses set ablaze from Smart Meter fires and homeowners’ fire insurance policies will not provide and/or deny fire insurance coverage for house fires started by Smart Meters! 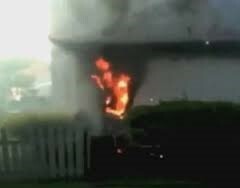 See this horrendous Smart Meter house fire story that happened in suburban Philadelphia, Pennsylvania, which I wrote about—Smart Meters Fire, Living Hell And Bureaucratic Messes, and still is not resolved! Mr. Joe Esposito’s Smart Meter research work must be taken seriously by everyone: consumers, states legislatures and Public Utility Commissions, federal agencies, and Congress. The public cannot be subjected to appliances or PUC rules and regulations that will make them and their children sick, plus increase the costs of healthcare for health insurance companies, Medicare and Medicaid. 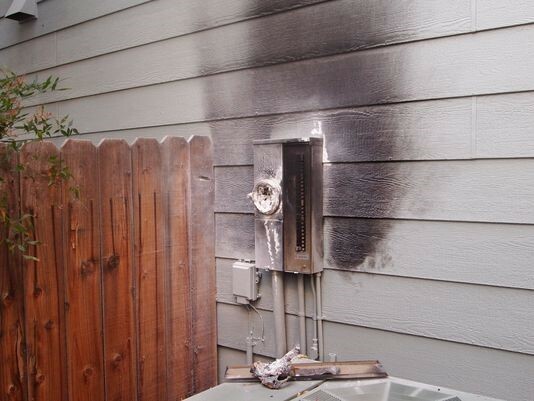 AMI Smart Meters aren’t what they are cracked up to be. Didn’t Joe prove it? This entry was posted on February 22, 2016 by Amir Alwani. 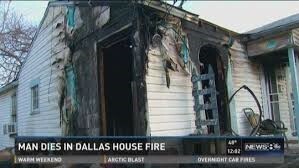 It was filed under health, news, radiation, science, tyranny, videos and was tagged with smart meters.